So the first “paint brushes” swept the canvas tonight. 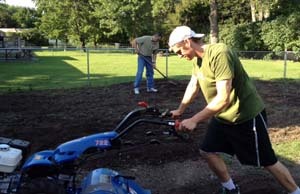 My nephew Mark and brother John figured out how the rear drive rototiller worked (without losing a limb). The hardware store staff where I rented it didn’t quite know how to operate it since it was a new model (made in Italy, of course, great art). My niece Jenna helped yesterday with the weeds and moving mulch and my other niece Emily cut the grass. Next steps of preparation to fruition – topsoil gets delivered tomorrow afternoon, sod on Friday and new tree hunting on Saturday. So, a new beginning blooming from preparation, planning, hard work and a wonderful family willing to be paint brushes with me.